We release MacMusicKB v1.01, a free AZERTY keyboards set to implement the dot (".") on the nuneric keypad and the brackets (" [ ] ") keys: A lot of software use the apple key + brackets as essential shortcuts or the apple key + dot to cancel actions, but due to a different key assignements on AZERTY keyboards, most users of these keyboards were unable to use it. MacMusicKB solves this! MacMusicKB includes the following keyboards: French, French numerical, Swiss French, Canadian French. This keyboards set works with MacOSX, and don't modify the original keyboards set that may still be used. Installation is Drag & Drop based. M-Audio has been working directly with Apple to ensure that all of the company's PCI-based products will be compatible with the PCI-X architecture introduced with the Power Mac G5. 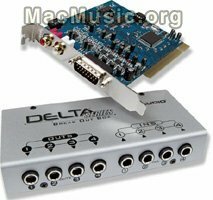 Delta models being redesigned for G5 compatibility include Audiophile 2496, Delta 1010, Delta 44, Delta 66, and Delta 1010LT. The Revolution 7.1 consumer surround sound card is already PCI-X compatible. There is no charge to upgrade your card If you purchased your Delta card on or after August 1, 2003, and upgrade costs are available on M-audio web site. Native Instruments offers to all registred members a free downloadable Sound Generator named Metaphysical Function. 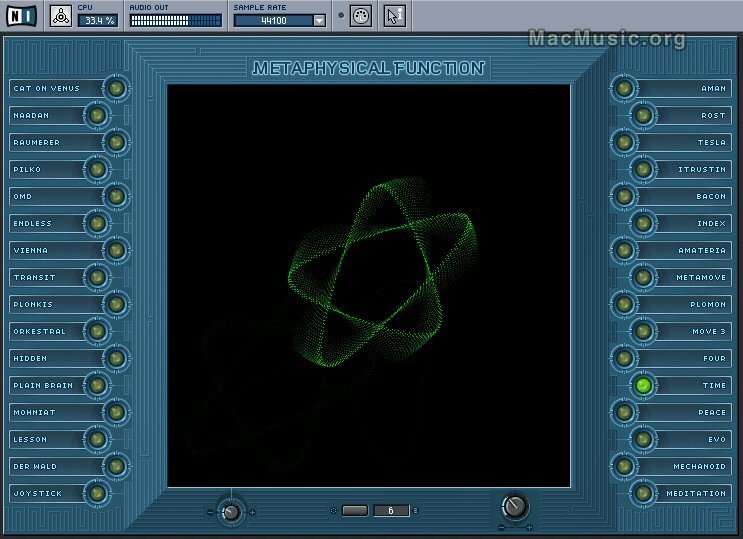 Here is how NI describes it : "Metaphysical Function is a fascinating self-playing sound generator, usable as a stand-alone application for Mac OS X and Windows XP/2000. This unique instruments blurs the distinction between sound and vision - combining multiple waveform visualization with dynamic parameter automation. Thirty-two presets, ranging from soothing ambience to disturbing soundscapes are included, and a progressive randomization function allows for limitless sound generation possibilities." 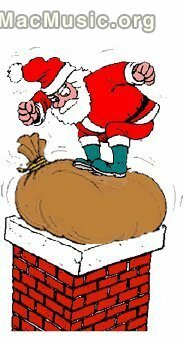 A Merry metaphysical Christmas to you all. Apple/Emagic new audio software coming soon ? Several sources told us that Apple/Emagic may soon release a new DAW software. This software would be primarily targeted at sound engineers more than musicians and would be a compliment of Logic. This application is Core Audio based and supports AudioUnits plugins. The User Interface is made by Apple who had started this project before acquiring Emagic. Apple may even release its own hardware developed by Apogee Digital. This software is clearly planned to go head to head with ProTools and dedicated DAW in its appeal to the professional recording and mixing world. Rumors or facts: time will tell!